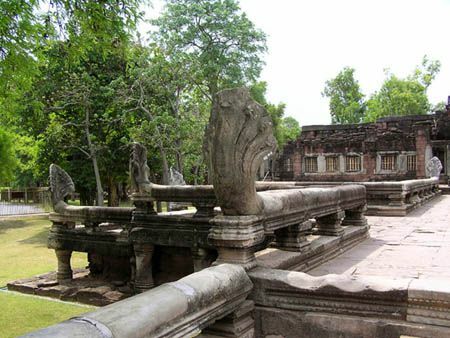 Photo Gallery of Korat or Khorat (Nakhon Ratchasima). 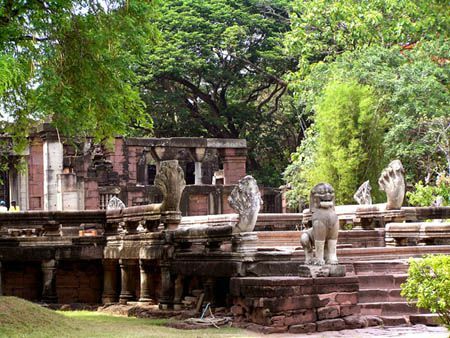 Korat is the gateway to Issan (Northeast area of Thailand) and the biggest city in the northeast. The largest ruins of Khmer in Issan, Phimai Historical Park, is here. 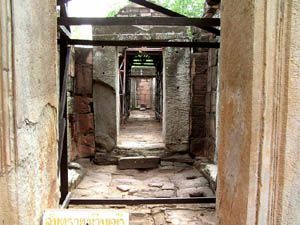 See Photo Gallery of Korat 1 (Nakhon Ratchasima) about the landmark of Korat (the statue of Thao Suranaree (Ya Mo)), the Rock Art about 3,000 years ago (Khao Chan Ngam Cave) and so on. 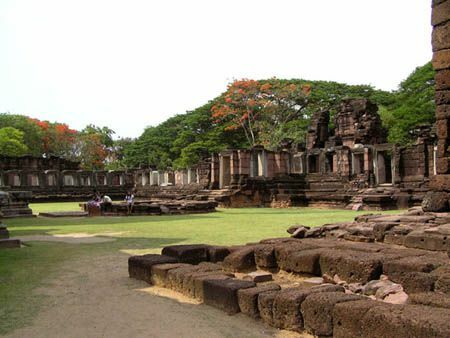 Phimai, the largest ruins of Khmer in Isan. 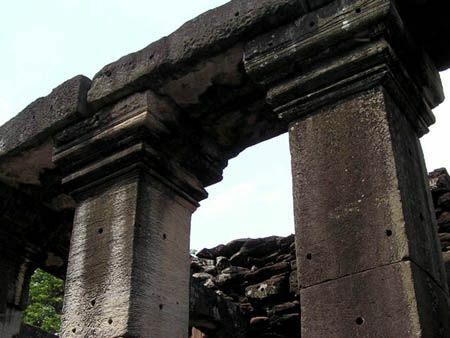 It's a wonderful tourist spot to visit. 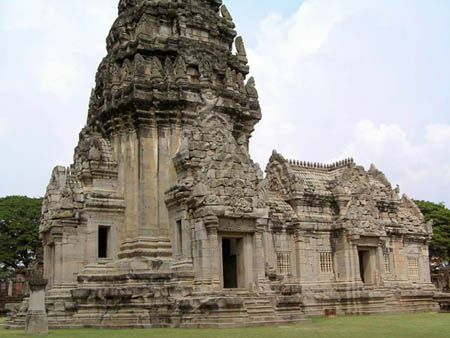 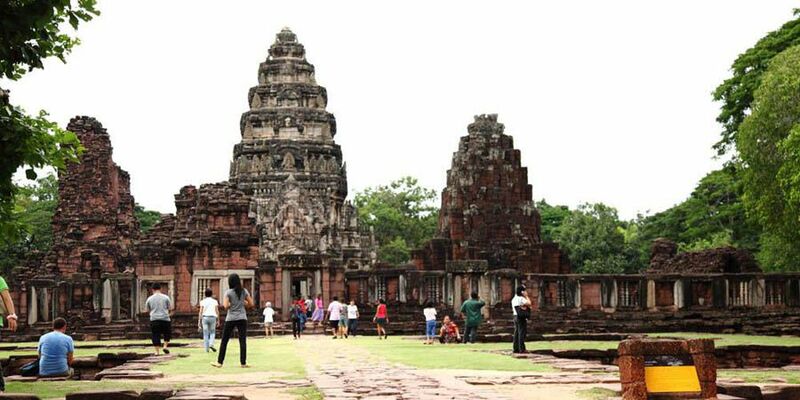 This place was built as a Hindu temple in 12 century and was in the Kingdom of Angkor ruled by Khmer people. 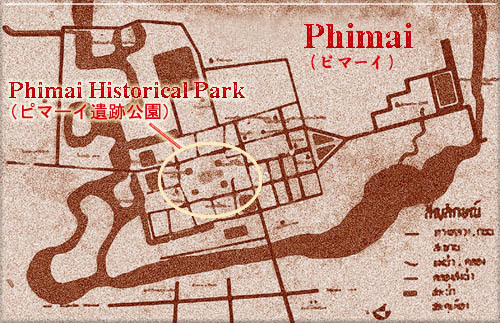 Only the center of the site is now shown as a historical park, surrounded by the walls, 1020 meters (north and south) by 580 meters (east and west). From the size, it is said to be a critical site next to the capital of Khmer Empire. 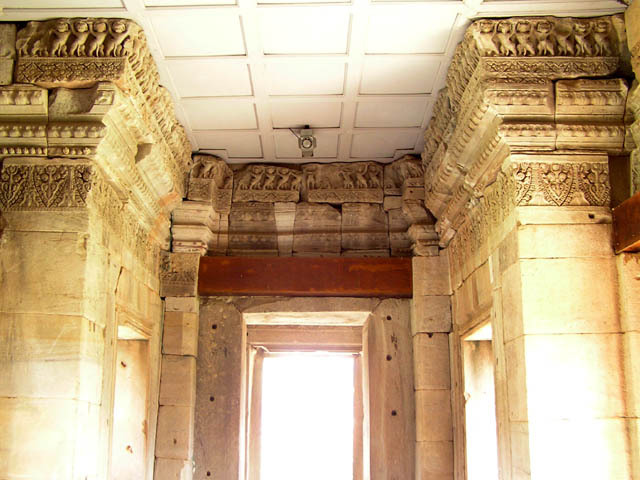 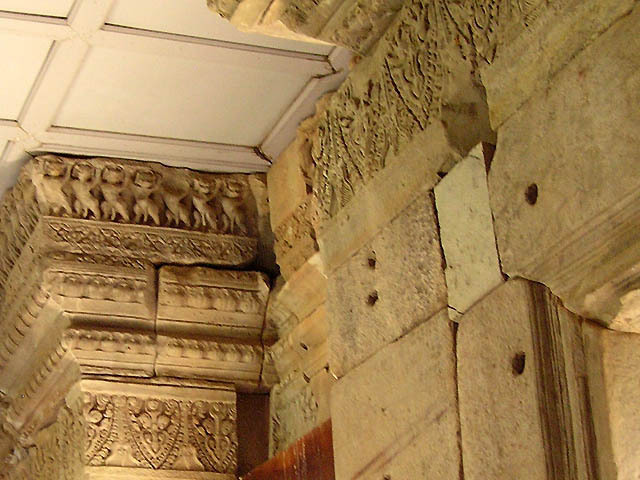 This temple is protected by two curtain walls, and you will see the entrance of the outer wall (Outer southern gopura (porch)) when you enter the park. 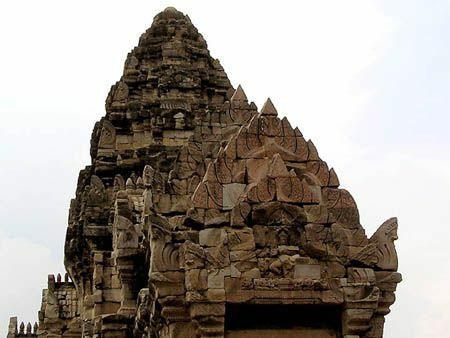 After the outer southern gopura, the typical Khmer-style prangs will be shown. 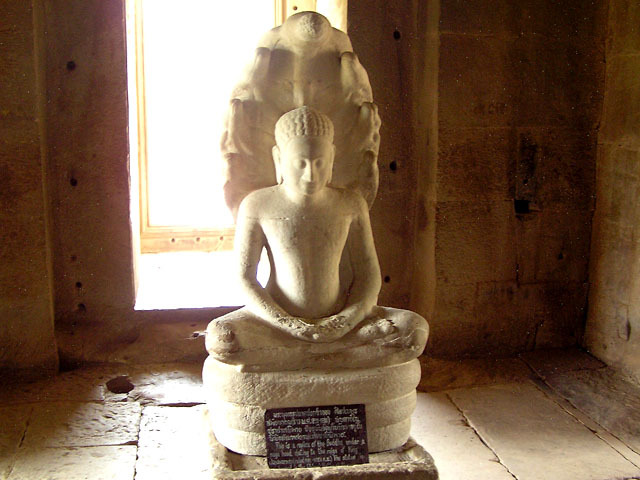 In a prang, the Buddha image (reproduction) sits training himself with his hands together. 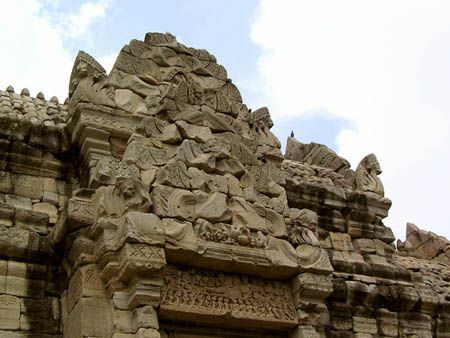 After entering the park, you will see the gate (Outer southern gopura). 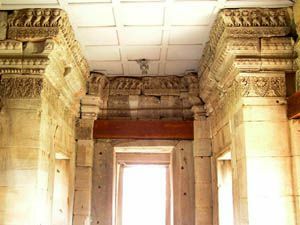 There are four gates at each of north, south, east and west, and it seems this southern gopura is the largest one in the four gates. 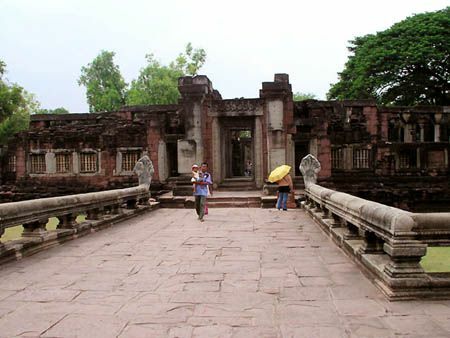 There is a bridge called " Naga Bridge " before the gate. 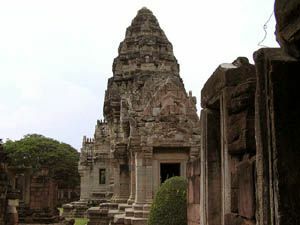 After passing the awesome gate (Outer southern gopura), you will see the typical Khmer style prangs (chedis), Prasat Phimai. 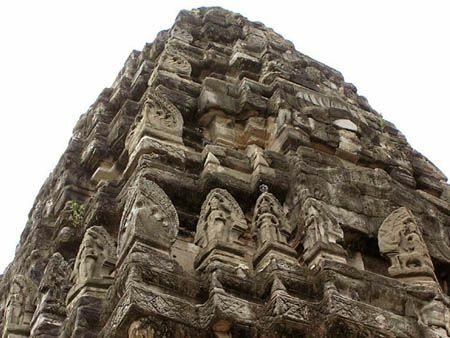 They are spectacular and very beautiful. After passing the awesome gate (Outer southern gopura), you will see the typical Khmer style prangs (chedis), Prasat Phimai. 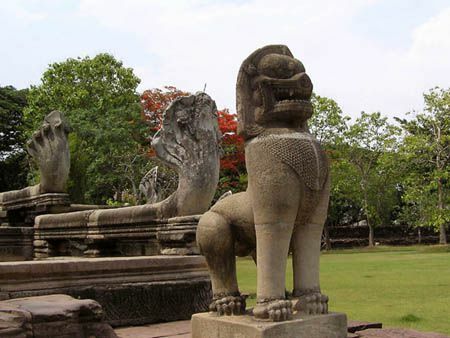 They are spectacular and very beautiful. 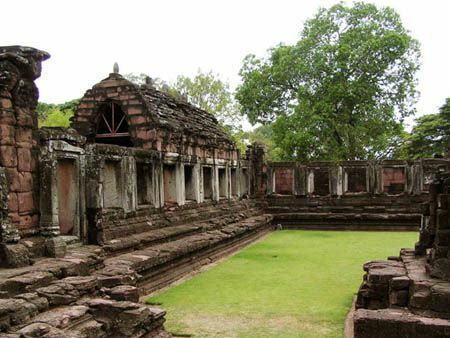 Although the shape is a little different, but the temple " Wat Sri Sawai " (or Wat Si Sawai), in Sukhothai Historical Park is also in the Khmer style. 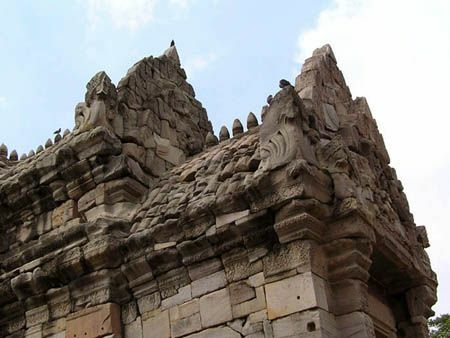 (Close-up of the prang in the center. 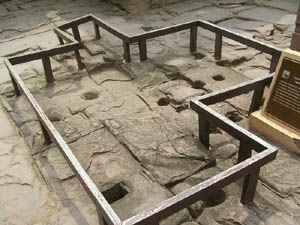 (This is called "Post hole" along the Passage Way. 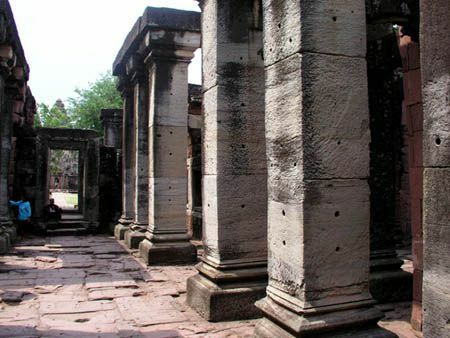 After passing through the arched gateways, there is a courtyard with a pathway that leads to the central door in the surrounding wall. 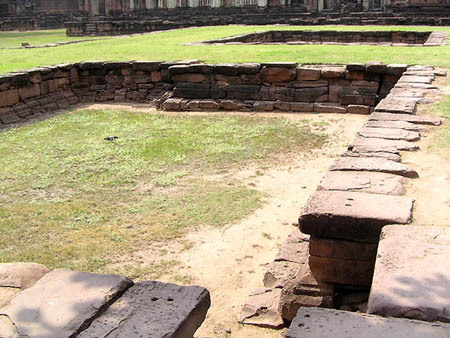 This courtyard is rectangular which is traced by a pathway all around. 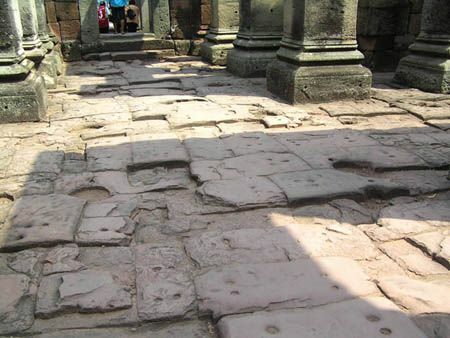 Post holes were found at intervals along the pathway during the restorations. 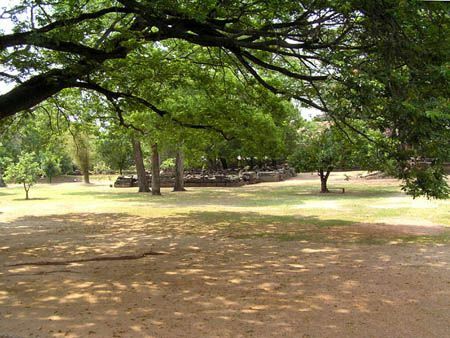 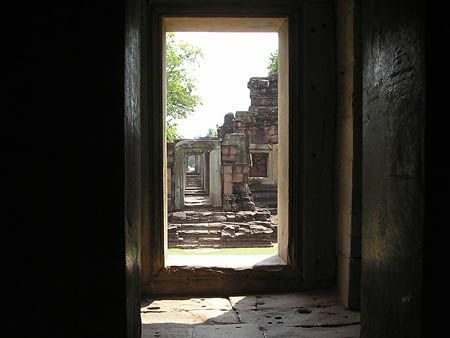 Now, you've reached the sanctuary, " Prasat Phimai " after the passage way. 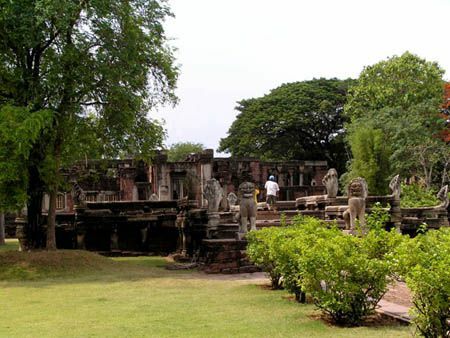 - Prasat Phimai, which is a Mahayana Buddhist Sanctuary, is situated in Phimai District, Nakhon Ratchasima Province. " 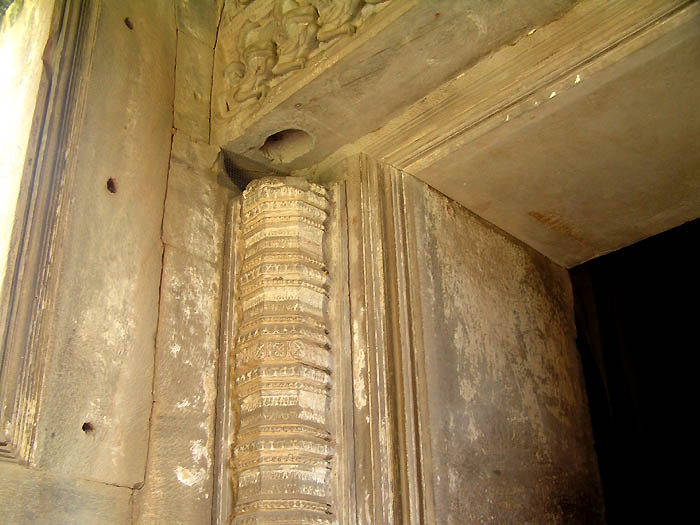 Phimai" is the same word as " Vimai " which appears in the Khimer(I guess Khmer) script stone inscription found on the door frame of the entrance. 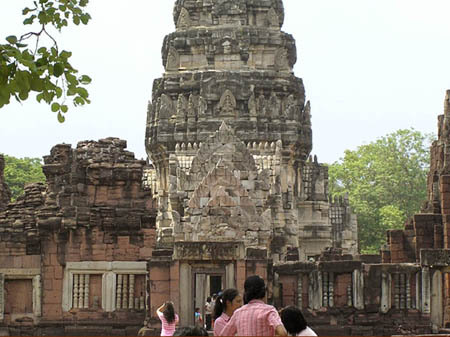 Phimai is a large rectangular ancient city surrounded on all sides by moats and boundary walls. 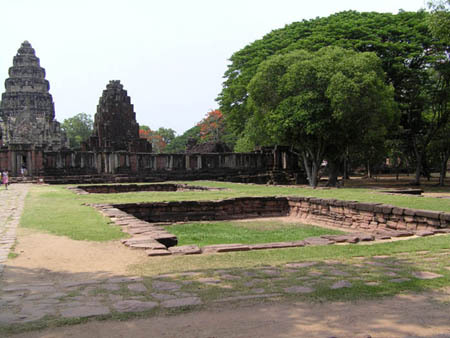 The construction of Prasat Phimai commenced in the 11th - 12th centuries A.D., with additions during 13th century. 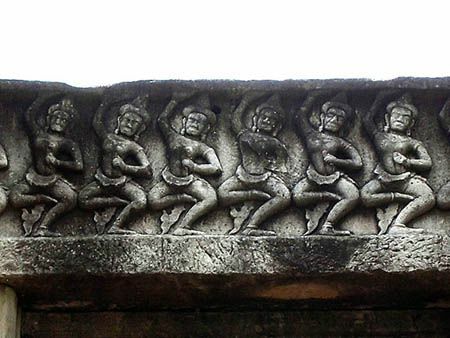 These dates are based on evidence found in stone inscription. 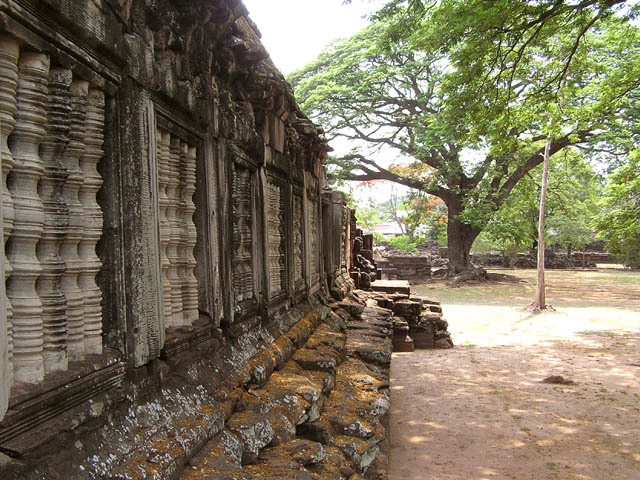 The archaeological and artistic features of Prasat Phimai differ from those found in other stone sanctuaries. 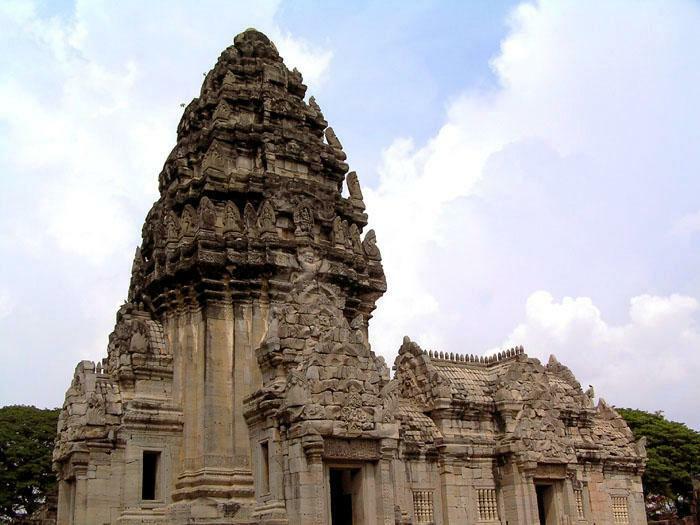 While most of them face east, Phimai faces southeast, the direction of Angkor capital of the ancient Khmer Empire. 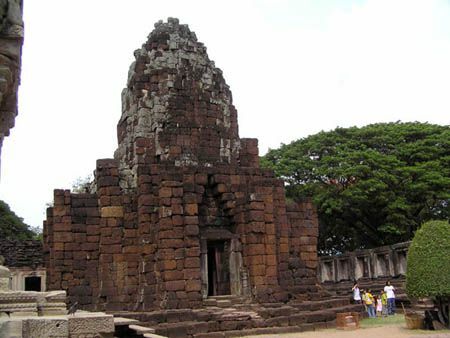 The principal tower, Prasat Phimai, is situated in the center of the city. 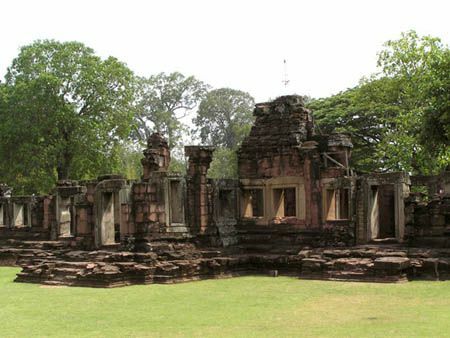 The Mun river passes on the northern and eastern sides while the Khem stream passes on the southern side. 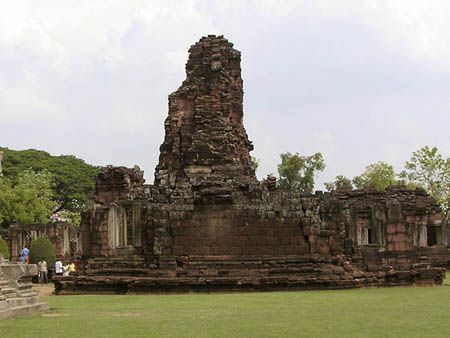 The Chakarat Stream passes on the western side and enters the Mun River at the Songkhran. 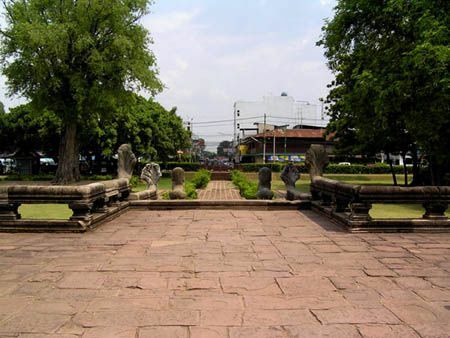 The ponds, Sa Kaew Sa Phlung and Sa Khwan, are located inside the walls of the ancient city, while the ponds Sa Phleng, Sa Bohd and Sa Phleng Haeng are located outside. 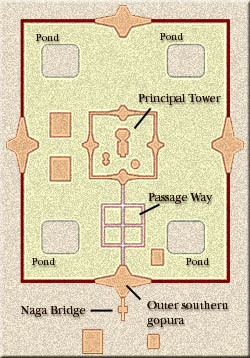 There is also a large reservoir to the south. (Made in order to place auspicious objects when the temple was constructed. 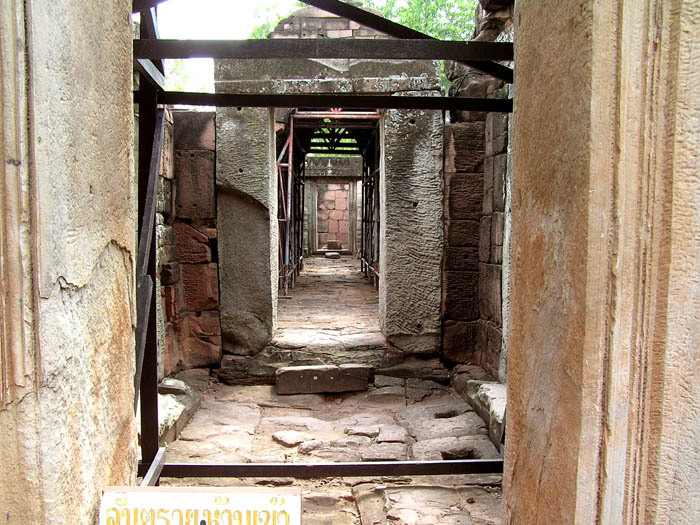 (The under side of Prasat Phimai. 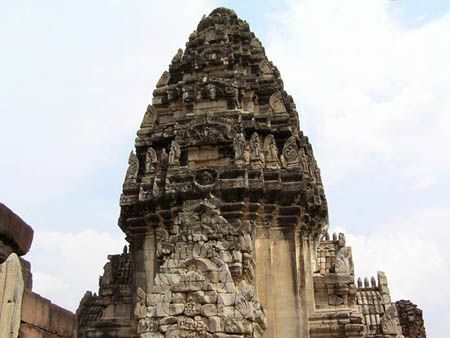 (A human shaped object is carved at the front of it. 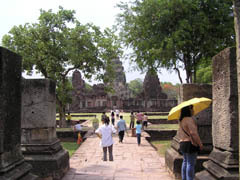 (Another prang on the left from the front. A white Buddha image is housed inside. 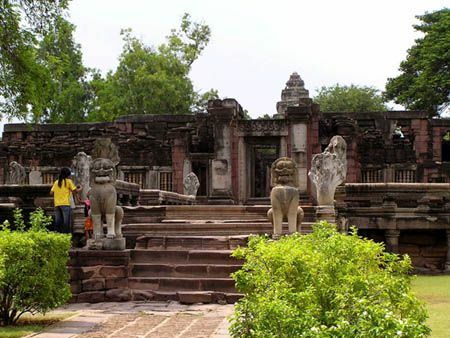 This is a replica and the original one seems to be in the Phimai national museum. This part shows the inside of Prasat Phimai. 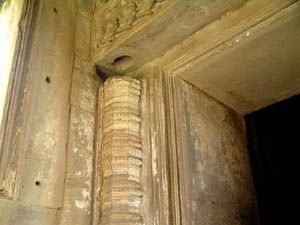 It's said that this was made around 1181 to 1220 in the era of King Jayavarman. 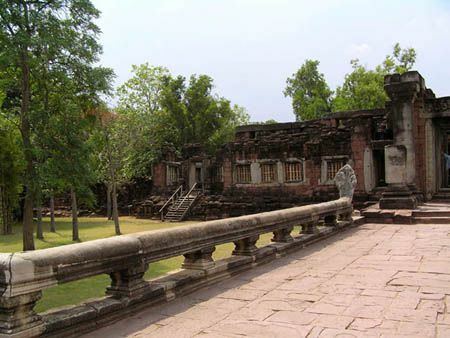 Prasat Phimai is surrounded by walls and it makes the atmosphere even more wonderful.